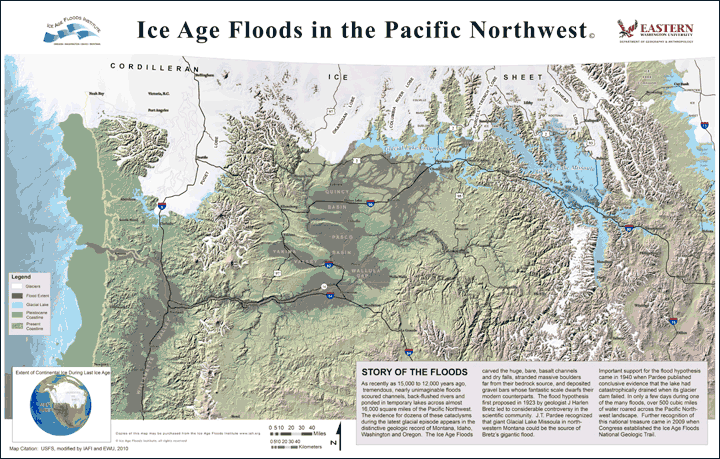 During the last Ice Age (18,000 to 12,000 years ago), and in multiple previous Ice Ages, cataclysmic floods inundated portions of the Pacific Northwest from Glacial Lake Missoula, pluvial Lake Bonneville, and perhaps from subglacial outbursts. Glacial Lake Missoula was a body of water as large as some of the USA’s Great Lakes. This lake formed from glacial meltwater that was dammed by a lobe of the Canadian ice sheet. Episodically, perhaps every 40 to 140 years, the waters of this huge lake forced its way past the ice dam, inundating parts of the Pacific Northwest. Eventually, the ice receded northward far enough that the dam did not reform, and the flooding episodes ceased. A perfect companion for On the Trail of the Ice Age Floods and On the Trail of the Ice Age Floods: The Northern Reaches, this updated map shows the locations of the glaciers during the last glacial cycle, Glacial Lake Missoula and Glacial Lake Columbia, the area inundated during the megafloods of the Ice Age, and the location of the greatly reduced sea level during the glacial maximum. Produced by the Ice Age Floods Institute in conjunction with Eastern Washington University, this beautiful color map shows considerable detail of topography, roads, and numerous towns and cities. This map will also be a great companion for anyone traveling the Ice Age Floods National Geologic Trail, approved by Congress in 2009. This will essentially be a network of marked touring routes extending across parts of Montana, Idaho, Washington, and Oregon, with several special interpretive centers located across the region. Size: -- Please Select -- Small map (not laminated) - 11" x 17"